The Cookie Puzzle: Blogging...kinda like a puzzle...right? Great Looking blog!! Congratulations and I have started following your blog so hop on over to mine and see mine!!! Thank you Roxanne...I am now following you also...I hope you don't mind..I added you to my Blog List! LOVE!! have fun with it, Kim!! I am looking forward to reading your posts! <3 ya! Thanks Princess Lene..your support mean soo much to me...you are the best! Congrats. I look forward to your One Year Blogiversary!! Thank you Felicia....I hope I can make it that long...and that by that time...be blog looks a little better! Ok, so you know what's really funny? I saw your blog and how pretty and loved the colors and the design and said to myself, "I wonder if she would like the logo centered at the top". I thought of telling you how and then I thought "how rude!" that your plan was probably to have it at the left all along. Then I read your post and giggled :-) So here's how I centered my logo. I did a search on Google on how to center your header and found this great tutorial that made it super easy. It will look like they are writing in another language, but just follow step by step and I promise it's easy. Honest: http://makincuteblogs.com/2011/02/how-to-center-your-header-in-blogger/ Your blog looks great and I'm so excited to have you as a blogging buddy :-) and your cookies rock! Oh...Princess Cristin...you crack me up..I am working on the "header" now...well actually, the dear sweet lady who did my logo offered to help me with it. Between you and me...I hate the way it looks right now...but keep checking..hopefully I will get it looking good soon...And thank for the encouragement..you have no idea how much it means to me! Love your cookies!! I'm an autism parent and blogger too. We have a site called Autism Pirate. You can find us on Facebook or at www.autismpirate.com. I would love to order some thank you cookies for our neighbors who supported us but putting up blue lights this month. I'm going to give you a call. Congrats on your new blog (totally following)! I recently started one too and I'm always excited to meet a fellow newbie! I'm amazed at how much there is to learn. It's so great that you've done two posts back to back. I'm trying to commit to a new post once a week to start. I will be stalking u to learn from u! Awesome blog! 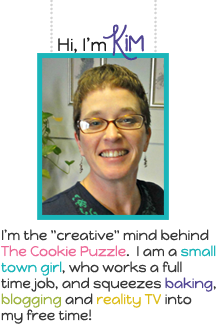 Loving the puzzle cookies, especially the minis - I LOVE minis!